If Your Book Was a Cupcake…. Anyway, back to those sweet mounds of deliciousness. The thing about cupcakes is — I tend to be kinda picky. I’m not a huge, huge fan of those cupcakes that are like, here is your ginormous mount of frosting that is about to crush this itty-bitty chunk of cake. I mean, they are pretty and all and I ohhh and ahh over them and I WILL eat them, but they aren’t my favorite. The other day, I went into a cupcake shop (I really don’t go often — although my waistline tells a different story!) Anyway, I went into the shop and they had– wait for it — CHEESECAKE cupcakes. I stood there drooling for a few minutes. Now, I wouldn’t want something that rich and decadent all the time, but a once in a while treat sounded AMAZING!! Okay, now that you all hate me for making you crave cupcakes today…. How does this relate to books? I was thinking the other day about the different kind of books and how we each have different tastes–kinda like we have different tastes in cupcakes, ya know? I was at a book festival and was talking to some young college students and they asked me to describe my writing. For some reason, I thought about a cupcake. My books are like that last cupcake. They are moist and fluffy on the outside (HUMOR!) but they aren’t all fluff. They have a rich, deep, creamy center that steps it up a notch. My characters have been former foster care children, former abused women, a woman who has insane fears due to being abducted as a child (this one is unpublished… maybe someday…), and men who deal with work-a-hol-ism, a man who has trend away from God as a teen after his sister died… just to name a few. They struggle with deep issues–(aka cheesecake…) But they are the center of the story… the filling… and are nestled around that fun outer layer. And of course they all have a romantic frosting that isn’t too much but isn’t too little, just the right amount! So see? My book as a cupcake! I thought it’d be fun today to share YOUR cupcake books. 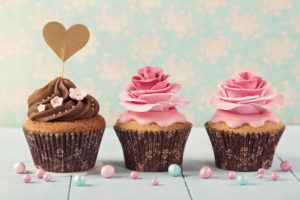 If the book you are currently reading were a cupcake, what kind would it be and why? And what kind are your FAVORITE book-cupcakes? Fun analogy. My mum used to make cupcakes with cream cheese and jam surprises in the middle- YUM! I like books with a bit of suspense thrown in. I don’t really enjoy books that are just all ‘fluff’, there needs to be depth to the story- hence why your cupcake analogy works so well for me!! Yup, that creamy middle makes a book extra delicious!!! Hi Krista! What a scrumptious analogy. At Mimi’s Cupcakes on the shores of Lake Michigan my favorite is Lucious Lemon cupcake with lemon buttercream frosting. Another flavor that might fit the analogy better is Carrot Cake cupcake covered with a cream cheese frosting, because carrot cake covers all food groups – veggies, nuts, and dairy. Also a good romance has a good plot (the cake) with something that is a little nuts and hopefully a sweet ending. My favorite romance that fits a carrot cake cupcake analogy is Paper Love by Aubrey Wynne. With the help of a stray homing pigeon and an old origami legend, Ben sets an unwavering course of romance to win Joss Palmateer’s love. Making 1000 cranes and talking to a stray pigeon may seem a little nuts, but the ending is sweet. Paper Love with its Chicago setting, I appreciated the historical details about the Buckingham Fountain woven into this inspirational romance. Very cool analogies!!! Thanks for sharing!! What a fun analogy! For my own books, my outsides are probably the dense cakes that you get at a cupcake shop (vs the fluffy cake at home from a cake mix of by scratch). But I still aim for not overwhelming and with that rich center and sweet frosting. Ohhh, you’re like my mother-in-law! She makes pound -cakes… moist but very thick. I prefer the fluff with the thick middle, personally, LOL (both in books AND cupcakes!!) To each their own!! I was simply going to read this post, and then I saw in the comments ” Lucious Lemon cupcake with lemon buttercream frosting.” I am now ruined for the day. HA! My books are carrot cake cupcakes. A bit of nutrition without shoving it in your face, topped with cream cheese frosting for a satisfying HEA. A lovely and tasty post, Krista. LOL! And the lemon cupcakes are nutritious too right?!? Lemons are a fruit!!!!!!! I think the book i just finished was a sweet with icing. A bit of fluff, but it was what i wanted at the moment. The book before it was a dense cake with a lot of layers! I think i need to sample some to decide my favorite😊! I’m not sure what kind of cupcakes my books are, but I do write books with lots of angst for my characters. I like a mix of books, but I like the emotional ones best–the ones that make me grab for a tissue. Angst…. emotional…. makes people cry…. I’d say a Jalapeno cupcake!!!! Oh gosh, now I’m craving a cupcake, Krista! Like my books, sometimes I like my cupcake with lots of layers, but sometimes I get need to chill out with something light and fluffy. Fun post, Krista. Do they have an “everything” cupcake like they do bagels? I guess that doesn’t sound very appetizing. What I mean is that I like a book with a little bit of everything–the sweet, the not so sweet, the humorous, the adventurous, a touch of sadness, some angst…but always with at least one “takeaway” spiritual truth and a happily-ever-after. I don’t know if we have a store dedicated to cupcakes here in our area (that’s probably a good thing, actually), but I’ve often looked at one in Florida when visiting the in-laws. Make that drooled over. One of these days, I WILL enter the doors. And hopefully come out again. :) Blessings! I love chocolate cupcakes with mounds of frothy icing. Chocolate icing made with real butter. Unfortunately I can’t buy them like that so, sigh, I have to make them myself. But I can’t say what my current book would be like if it was a cupcake. Because I only have one favourite cupcake! I’m not sure what my answer is to your question. But I do know that I love to read good books and I love eating chocolate cupcakes with chocolate frosting!! Enjoy your Thanksgiving Day desserts!! Sorry so late in commenting, I’m tying to get caught up on the blogs I follow…lol! Now you got me craving cupcakes….well done Krista….haha!